Formed in 1643, the Cambridge Latin School was the second public high school in the not yet named United States. Located in Cambridge, Massachusetts, it was formed shortly after the Boston Latin School was established across the Charles River. For more on the history of CRLS, check out The Cambridge Rindge and Latin School: Yesterday and Today, a book by John Langome. The Cambridge Latin High Crew raced from 1889 until the stock market crash of 1929 ended the program. A small program, the team raced in fours against rivals Rindge Technical School and Brown & Nichols. The program resurfaced in 1989 as the Cambridge Rindge & Latin Crew Club (Cambridge High & Latin and The Rindge Technical School merged in 1978) and began rowing with the Community Rowing program in Boston. While the club often fielded complete eights, the team rowed under the name and colors of Community Rowing. Driven to practice by teachers/coaches Linda Lipkin, Phyllis Bretholtz, and Tobe Korsgren the Club was enthusiastically supported by Athletic Director Bill Bates and it was their combined efforts that led to the inclusion of a CRLS boat bay in the remodeled Cambridge Boat Club in 1999. Thus, Spring 2000 was the first official season of the CRLS crew under its own name and colors. The season began that January as a part-time, non-racing program with 12 students with little rowing experience and no equipment. By March, it had exploded into a six-day-a-week varsity program with 50 kids, five boats, five races, and two coaches. The rest, as they say, is history. 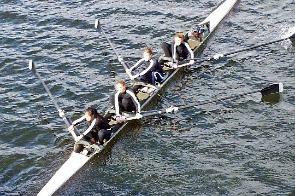 CRLS Crew is a sport at the Cambridge Rindge & Latin School – the district public high school in Cambridge, MA. We are a club sport in the Fall and a varsity sport in the Spring. We have both a boys and girls team and we compete in three leagues – the Dual County League, the Massachusetts Public School Rowing Association (MPSRA) and the New England Interscholastic Rowing Association (NEIRA). Our parent group, the Association for the the Support of Cambridge Crew (ASCC) is organized to provide support for the team at events and to help raise money for team expenses. The ASCC is organized under the non-profit Friends of Cambridge Athletics (FOCA) organization. © 2019 CRLS Rowing. Theme by Anders Norén.